Takeout cuisine and coffee in the Big Apple will no longer come in non-recyclable polystyrene foam containers or cups. Polystyrene foam — often mistakenly referred to by the brand name Styrofoam — is one of the most troublesome forms of single-use plastics to environmentalists. It’s non-recyclable, carcinogenic, and could take a million years to decompose, according to Cleveland State University. Additionally, the expandable foam beads it’s made with are particularly dangerous to marine animals, becoming lodged in their intestines and acting like a sponge for other toxins. These are among the reasons New York City became one of the first U.S. cities to ban the product in 2013. After facing lawsuits and other hurdles, that ban is now finally in effect. It became official on January 1st, but restaurants still have until June 1 before they get fined, up to $1000 per offense, according to a press release by the city. “Single-service foam food and beverage containers cannot be recycled in a manner that is economically feasible, environmentally effective, and safe for employees as part of the City’s curbside recycling program,” city officials wrote. 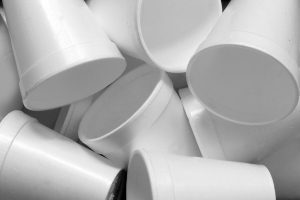 Americans alone throw away 25 billion polystyrene coffee cups a year, according to the EPA. 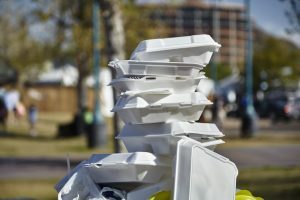 Other cities that have enacted laws against polystyrene include: Seattle, Portland, San Francisco, Los Angeles, San Diego and Washington D.C. though not all of them have come into effect yet. 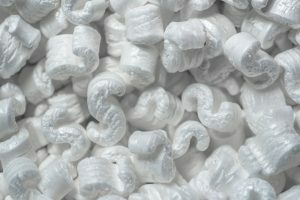 Maryland is very close to becoming the first state to ban polystyrene.